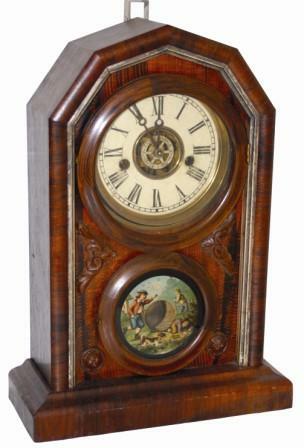 Waterbury Clock Co. mantle clock, "Cardinal", ca 1881. Original and very nice rosewood veneered case standing 16.5" high. Nice veneer but with the usual corner or edge nicks. Gold or silver, around the front is dirty and largely intact. This is a very unusual case, note the two round doors, different sizes, each with their own latches, excellent glasses, and carved ornaments around the lower door. Original painted dial, hands, brass rings, alarm ring, and alarm movement in the bottom, over the complete paper label. One day movement strikes on a coil gong. The brass bob is in the case. This is a very unusual shelf clock. Ly-Waterbury No. 1504.